Joseph Trego first came to Kansas Territory in June, 1857, and settled near Mound City (originally Sugar Mound) in Linn County, Kansas Territory. He returned to his home near Rock Island, Illinois, to prepare to move and moved to Kansas Territory in the fall of 1857. In March, 1858, he returned to Illinois to bring his wife and three girls to their new home. 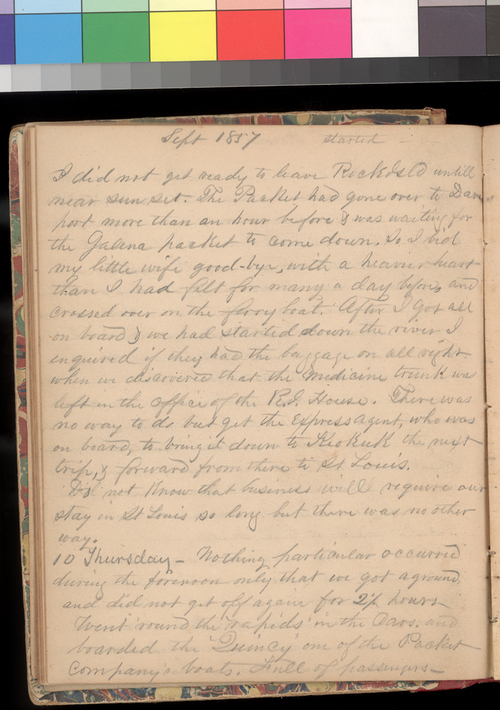 These diary entries start with his second trip to the territory in September, 1857, and describe the various trips to and from Kansas Territory and his various activities. The diary entries from March 17, 1858, to May 25, 1858, (15 pages) are not included. Trego, along with Thomas Ellwood Smith ("Ell" in the diary entries) and his brother Edwin Smith, constructed and operated a sawmill on Little Sugar Creek. Trego was involved in town company activities, and the sawmill furnished lumber and shingles for many of the buildings in Mound City. The diary entries provide information on the efforts of settlement including the furnishing of a cabin and construction of the sawmill. They document the operation of the sawmill and other activities in the area, including some of the border disputes. Trego was a free state supporter and this is reflected in some of the entries.